While researching the background of Henry Trares in my previous post, I learned of an odd coincidence concerning the deaths of two of Henry’s sons, Florian and Roman Trares. Roman J. Trares was born 30 March 1893 in Edwardsville, Madison, Illinois. He died 8 May 1959 in Taylorsville, Christian County, Illinois. Former residents Florian and Roman Trares, sons of the late Mr. and Mrs. Henry Trares, Sr., of Edwardsville, died, apparently within a short time of each other, relatives here learned Tuesday morning. Florian, husband of the former Edna M. Motz of Edwardsville, died of a heart attack at 6:20 p.m. Monday at a hospital in Danville, where he resided. He was associated with the Sugar Creek Creamery Co. there. The body of Roman Trares was discovered about 7 o’clock Monday evening at his home in Taylorville when relatives sought to notify him of the death of his brother. The exact time of death has not yet been established. Roman Trares was born here March 30, 1893, the son of the late Henry and Frances Heddergott Trares. His only survivors are the sister, Mrs. Keshner, and a number of nieces and nephews. The body will be returned to Edwardsville for burial in the family plot in St. Mary’s cemetery. No other plans for either funeral were available. The Find-A-Grave entry also said that Roman Trares was a World War I veteran, serving with the Arkansas CFR 1 CL 668 Aero Squadron. In addition, I found a number of ads and announcements in the Edwardsville Intelligencer which touted “Roman Trares and his Novelty Orchestra” as playing in the area during the 1920’s. Apparently, Roman was a noted pianist with his own orchestra. Henry Trares was born 20 April 1855 in Randolph, Portage, Ohio. He was the son of John Lewis Trares and Nancy Mary Ann Knapp. Nancy was the daughter of John Adam Knapp and Elizabeth Andes. John Adam was the brother of our immigrant ancestor, Franz Adam Knapp. Henry’s uncle, John Sebastian Trares, whom I have already written extensively about in previous posts, had established a drug store in Edwardsville, Illinois. When John Sebastian went home to Ohio for a visit, his nephew, Henry, then 14 years old, decided he wanted to “go west” when his uncle returned. Henry did and soon became a clerk in his uncle’s Edwardsville, Illinois store. He continued to work for his uncle until 1882, when he and a partner, E.A. Keller, opened a hardware store called Trares & Keller. In 1892, he purchased the business of A. Gerber & Son, a general store housed in the Gerber Building at Main Street and Hillsboro Avenue in downtown Edwardsville. Henry Trares became a successful and well-known businessman in Edwardsville. For 18 years his store prospered in the Gerber Building. Then, in 1909, a new building was erected which became the largest department store in southern Illinois in the Schwarz Building. Henry Trares was elected president of the First National Bank. When the bank was consolidated with the Bank of Edwardsville, he was elected chairman of the board of directors, a position he held for many years. Henry also was active in the Edwardsville Home Building & Loan and was an organizer of the People’s Loan Association. He also was active in other civic activities, including being a member of St. Boniface’s Catholic Church, the St. Boniface Benevolent Society and the Holy Name Society. He was a member of the Catholic Knights of Illinois and the Knights of Columbus. On May 20, 1879, Henry married Frances Heddergott, a member of an old Edwardsville family. Frances died June 26, 1933, four years after celebrating their golden (50th) wedding anniversary. Henry Jacob Trares (1880-1955), who, like his father, became a merchant and took over the family mercantile business. Wilbur Alvin Trares (1891-1952), who became a Madison County, Illinois court judge for more than 24 years. Henry Trares died at his home in Edwardsville on June 14, 1935, and was buried in St. Mary Catholic Cemetery in Edwardsville. Can you identify Uncle Gary? Tim De Frange kindly shared this vintage photo with us. Thanks, Tim! As you may remember from a previous post, Tim shares some common ancestors with us via the Eichler connection. If you don’t remember the post I wrote about the Eichler connection, you can review it here. I thought it might be fun if we try to identify the little boy in the photo who we all know and love now as Uncle Gary Knapp. Vote for your choice and we’ll announce the results on Knapp Notes on the day when we announce the date of the next Knapp Family Reunion. Can you pick out Gary in this picture? Vote for you choice by clicking the appropriate number below. Esch Mound Effigy Pipe – Hopewell – Found near Sandusky, Ohio. While surfing the net doing some genealogy research this morning, I ran across a Kent State University student’s thesis about the archaeological find in a Portage County Metropark. Chloe E. Bragg’s Towner Mound: Creating Content and Sparking Curiosity for the Portage County Parks answered some questions for me. As many of you know, I am not a Portage county native, so whenever someone starts talking about Portage county local history, my ears perk up. Such was the case when on one of our dates, my husband took me to Towner’s Woods for a hiking excursion. One of the things he pointed out to me while we were hiking was the Hopewell burial mound that had been found there. What did they find when the site was excavated in the 1930’s? What happened to the artifacts they unearthed? How old is the burial mound? Well, if you’re as curious about that as I was, you can click the link to Chloe Bragg’s thesis and read more about Towner’s Mound. You can also visit the WordPress site that Chloe built to give park visitors more information about Towner Mound. I hope the Portage County Parks folks incorporate Chloe’s work into their website soon. It’s a significant improvement on what they have posted on their site now. When the Towner Mound site was excavated, one of the burials was reported to be that of a Hopewell princess. It is said that a guardian spirit watches over her tomb and will harm anyone who disturbs her rest. One supposed incident occurred in the 1950′s, when the guardian left strange claw marks on the car of some teenagers who camped on this mound. It is also said that the spirit of a pioneer widow, who was murdered by neighbors over a land dispute, wanders these trails along the outskirts of the park. Not having been there at night, I can’t say whether those stories are true or not. And since the park closes at dusk (if you’re caught there after dark, it’s considered trespassing), it doesn’t look like I will be verifying those stories anytime soon. However, my husband used to go mountain biking at night through Towner’s Woods — but nothing unusual ever happened to him or his cousin, Tom. There is also talk of some tunnels in the area. If you know anything about the tunnels or just have an interesting story to tell about one of your own visits to Towner’s Woods, please share it with us. Bragg, C. (2015). Towner Mound: Creating Content and Sparking Curiosity for the Portage County Parks. (Electronic Thesis or Dissertation). Retrieved from https://etd.ohiolink.edu/. Towner Mound WordPress site created by Chloe Bragg to share her research findings about Towner Mound. For more about Ohio’s Hopewell, visit Ohio History Connection. The photo of the pipe above is a Hopewell pipe found near Sandusky, Ohio, at the Esch mound. Portage County Parks District website about Towner’s Woods. DeadOhio has a discussion about Towner’s Woods being haunted. Scroll down to read the comments to learn more about those tunnels. Ohio Exploration Society. Founded in the summer of 2000, the OES is a group of urban explorers who visit both well-known historical locations and those forgotten with time. OES members research and photograph locations and share their research and photos online. This group has documented some interesting sites. They have a section on Portage County sites, including Towner’s Woods, as well as a host of other interesting sites. Not long ago, I succeeded in convincing my better half to submit a DNA sample to ancestry.com for testing. We were pretty certain that the results would confirm what we knew about the Knapp-Mileski heritage. My father-in-law has always said he was 100% German. And we knew that the Mileski/Milewski side had emigrated from Poland to the U.S.
Well, the results are in… and we were surprised to learn that our Knapp/Mileski ancestry is a little more varied than we thought. Just as we expected, Mark is of 99% European heritage, with 50% coming from Eastern Europe and 40% coming from Western Europe. The real surprise came in looking at the trace regions. Like a lot of people with roots in Europe (myself included), we learned that there is some Scandinavian influence. Those Vikings really got around in the old days! Long an admirer of all things British (Dr. Who, James Bond, Monty Python and George Harrison) he was DELIGHTED to learn he has some British heritage in there somewhere – a whopping 3%! The most intriguing part for me was finding out there was 1% from the Iberian Peninsula (Spain or Portugal). This confirmed what a gentleman from Germany, our cousin, Christoph Trares, told me about the origins of the Trares family in Germany. You can read Christoph’s comments and my posting about a Trares Spanish connection by clicking the link. Scroll down the page to read Christoph’s comments. In any case, it is always wonderful when DNA results confirm an oral tradition handed down in the family. And thanks again to our German cousin Christoph for sharing that nugget of information with us. Cousin Christoph, please feel free to get in touch with us and share anything else you may know about our mysterious Spanish ancestor! Just a quick post to let you know I have posted a reminder note on the Reunion News tab about the organizational meeting happening in June. Please take a moment to go there, jot down the date/time and PLAN TO ATTEND! Chef’s skills (Knapp Family Association will provide main entrees) but everyone is invited to bring a dish to share. Attend the organizational meeting to stake your claim to your “signature” dish! Family research contributions (I know I can’t be the only one who has caught the genealogy bug in the family!) Email digital copies to knappnotes@gmail.com and I will post them. NOTE: If you send me your recipes, we could publish a Knapp Family Cookbook! I am dying to do an e-book version and would gladly volunteer to do that. But I need your help: SEND ME YOUR RECIPES!!! Cookbook sales could help defer costs. In short, there are many ways you can choose to help. We welcome anyone who is interested to attend the organizational meeting. Uncle Gary and I look forward to seeing you all there! Have a great weekend, gang! When the father of a fourth great-grandson of John Knapp and Agnes Trares Knapp wrote to me recently, I was reminded of when I was bitten by the genealogy bug. This post is a shout-out to a Knapp cousin by marriage, Tommy Woodward, who (just like yours truly) is hunting down his spouse’s ancestors so that his son can know just as much about his mother’s Knapp, Moledor and Trares ancestors as he does his Woodward heritage. 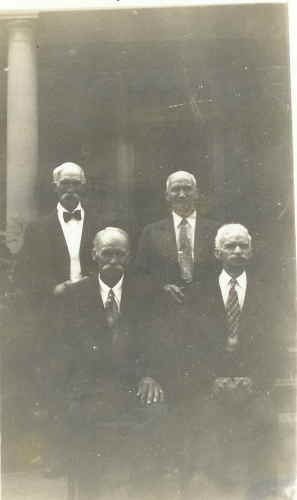 The photo shown above is of the Moledor brothers: Philip, Adam, Henry and John — all sons of John Moledor and Anna Mary Berg. John Moledor was born in Hesse-Darmstadt, Germany on 11 Jan 1818 and died on 11 Apr 1876 in Randolph Township, Portage, Ohio. Anna Mary Berg was also born in Germany and died in June 1901. These are our immigrant Moledor ancestors. This one is for Tommy and his son, Curtis. Happy ancestor hunting, guys! Also: check the Reunion News tab for the latest updates about the 2015 Knapp Family Reunion! Built in 1881, it was most recently a feed and supply store. But that business closed in 2012. Earlier this year, the former Wheeling & Lake Erie railroad depot was in danger of being torn down. Carter Lumber purchased the building in 2012 and offered it to the city of Kent. But Kent didn’t want it. And the Kent Historical Society didn’t have the financial resources to take on another property. That’s when local businessman Ted Klaassen, Jr., stepped forward to save the former train station. At the end of July, the building was lifted off its foundation and moved to Klaassen’s property across the street. Eventually, the building will be rotated and placed on its permanent foundation so the side that faced the rails will continue to point towards them. Newspaper reports indicate Klaassen plans to use the building for storage. I am just glad someone stepped forward to save this local landmark. See step-by-step pictures of the actual move and read more about the journey across the street. And a big thanks to the Akron Railroad Club for posting all of these wonderful photos of the move on their blog! 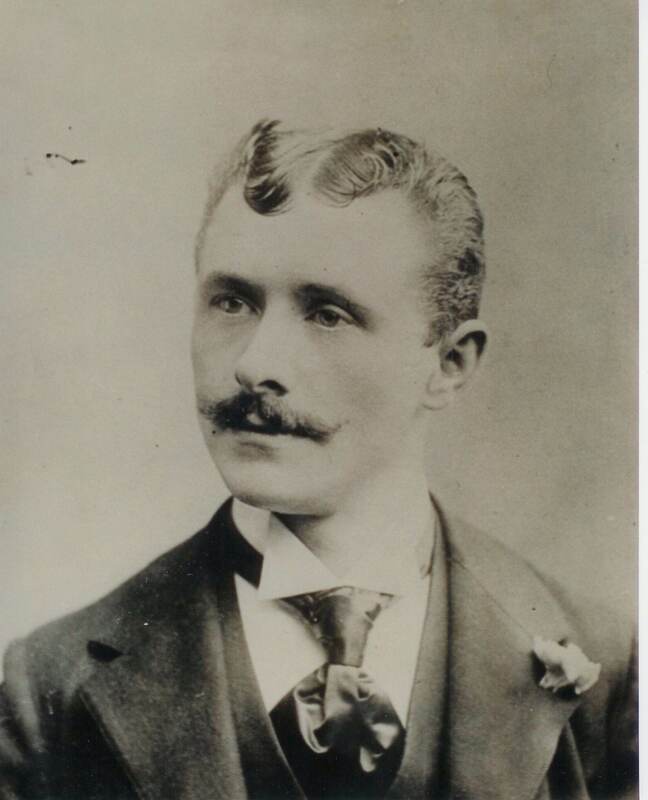 In case you are wondering who the dapper gentleman in the photograph is – he is Paul Kurst’s great-grandfather, Peter Frank ANTES, who was born on Christmas Eve in 1870 in Erbach, Hessen, Germany and died 24 May 1926, in Bronx, Bronx, New York. Peter Frank ANTES married Wilhelmina (Minnie) Katherine Müller on 23 Oct 1901 in Manhattan, Kings, New York. She was born in July 1872 in New York and died 4 July 1919 in Bronx, Bronx, New York. Paul Kurst contacted me not long ago and requested access to Knapp Notes. Before Paul reached out to me, I had no idea there was a branch of the Andes family who had settled in the New York area. That’s why his willingness to share information about this side of the family is so much appreciated. Paul has shared a document outlining how his line is related to our KNAPP line. I posted it on Knapp Notes under Document Gallery >> Misc >> GH Antes Ancestors. It seems Mr. Kurst and the Knapp clan share a common ancestor back in Germany: Johann Wilhelm ANTES, father of our immigrant ancestor, Peter ANDES, who came to America and died in Randolph, Portage, Ohio in 1850. Johann Wilhelm ANTES was born 22 May 1728 in Kirschausen, Hesse-Darmstadt, Germany. He married Anna Katharina EISENHAUER, who was born 4 Dec 1739 and died 8 Feb 1799 in Germany. Their son, Peter, came to America sometime after 1780. It will be interesting to see if Paul and I can track down more of Peter Andes’s siblings and find out what happened to them. Anyone wishing to comment or share information can send us an email. I subscribe to several genealogy services which help make my research a lot easier and much more productive than it was back in the old days. I am also a big fan of the free resources offered on the internet, like Cyndi’s List, Find A Grave and the great site run by LDS familysearch.org. All great resources – and so many of which are free, which is great if you’re doing research with a shoestring budget. That is why I was very concerned when I opened my newsletter from Mocavo‘s Michael J. Leclerc and read more about a term which was new to me: Net Neutrality. What does Net Neutrality mean? It means no matter how big or small you are, everyone has equal access on the internet. Net neutrality levels the playing field for everyone. A small company has as good a chance at growing and succeeding as a larger company. Take that away and we all stand to lose. One of the basic precepts of the internet has been equal access for all. No matter how large or small your company or your web presence, your ability to reach customers was the same as everyone else. This week federal courts ruled that current FCC rules maintaining Net Neutrality are illegal. What does this mean? It means that internet service providers (ISPs)can now charge whatever they want for access. They are also free to make deals with individual companies to provide “fast” access to their website, while dropping other websites to such a crawl that one would not be able to properly use them. This will give these large companies the ability to shut out other websites. This will limit the ability of new organizations to come along and introduce new products. No one would be able to see them. They would not have the opportunity to grow. I hope you take a moment to read Michael’s article and (even more important) take the time to make your views known to Congress. There are links in Michael’s article to additional CNN coverage and also how to voice your opinions about the subject. If you have an opinion about this subject, please post it.